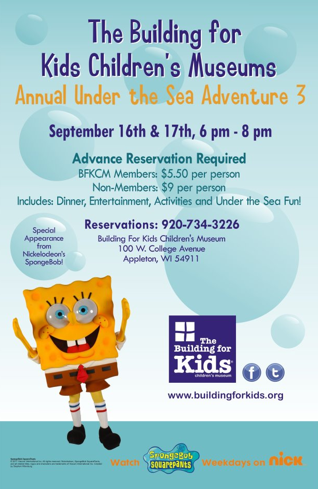 Posted on Sep 9, 2011 by Appleton Downtown Inc.
Sponge Bob is coming to the Building for Kids. Reserve your spot at the Annual Under the Sea Adventure 3! Friday or Saturday, Sept 16 and 17 from 6-8pm. Enjoy dinner, entertainment, activities and Under the Sea Fun!